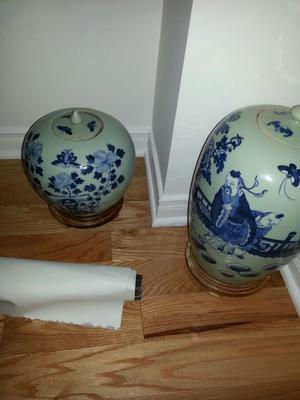 I recently inherited two Chinese pottery items and wanted to learn a little bit more about them. Would love to find out what their use was, how old etc. Let me know if more pics are needed. Thank you! Thanks for taking the time to let me know. Makes sense (age) I do have other pictures how do I post on this same thread? Closeups of faces and full view, as well as the bottom would normally be best for evaluating. However, from these picture it seems that you have late Qing dynasty (19th century) jars with blue & white decoration on celadon ground. It is most likely that these items were made for display as their main purpose, not as containers.